Early maize farmers selected for genes that improved the harvesting of sunlight, a new detailed study of how plants use 'doubles' of their genomes reveals. The findings could help current efforts to improve existing crop varieties. Oxford University researchers captured a 'genetic snapshot' of maize as it existed 10 million years ago when the plant made a double of its genome – a 'whole genome duplication' event. They then traced how maize evolved to use these 'copied' genes to cope with the pressures of domestication, which began around 12,000 years ago. 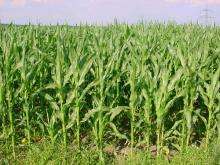 They discovered that these copied genes were vital to optimising photosynthesis in maize leaves and that early farmers selecting for them 'fuelled' the transformation of maize into a high-yield crop. A report of the research is published this week in the journal Genome Research. It is particularly useful for such genetic detective work that close relatives of maize did not duplicate their genomes 10 million years ago: those that retained a single copy went on to become the plant we now know as sorghum. This enabled the researchers to compare genetic data from these 'duplicated' and 'non-duplicated' descendants of ancient maize, something that is not yet possible with other duplicated crops like wheat. In the wild plants have to overcome the challenges posed by pathogens and predators in order to survive. However, once domestication by humans began plants grown as crops had to cope with a new set of artificial selection pressures, such as delivering a high yield and greater stress tolerance. More information: The impact of widespread regulatory neofunctionalization on homeolog gene evolution following whole genome duplication in maize, Genome Research, 2014.